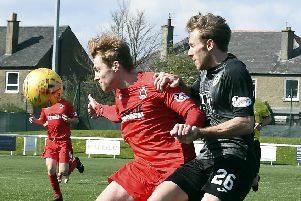 Edinburgh City boss Gary Jardine admitted he had no complaints about the outcome after his team’s eight-match unbeaten run was ended in a 2-0 home defeat by Arbroath. Goals in either half from trialist Eddie Ferns and Omar Kader gave the visitors a deserved victory, becoming the first team to beat the Citizens since Clyde back on October 15. Jardine says the target now for his players is to begin another undefeated run. The hosts survived an early scare when David Gold arrived from deep and fizzed his delivery across goal, when any sort of touch from Ferns would have surely resulted in the first goal. The opener came soon after. Ferns latched on to a through ball in the area and showed good composure to dink his finish over Andrew Stobie and in, despite the best efforts of Ryan Porteous on the line. Ouzy See claimed for a penalty at the other end after he felt he was bundled over by Ricky Little when in on goal, but referee Gavin Ross rightly waved play on. Mark McConnell’s near-post flick was then blocked before Ricky Gomes was required to make a save. Mark Whatley’s early second-half free-kick was well struck, but drifted wide with Stobie standing and hoping. Gavin Malin’s set piece from a much wider angle required a strong hand from Stobie to divert it over. Malin then missed the best chance of the game when Kader rolled the ball to him ten yards out in front of a near-enough open goal, but rather than killing the game, he ballooned the ball over. A second looked likely for the Red Lichties, and it duly arrived shortly after the hour via a sweeping counter-attack. Bobby Linn broke free on the left, and with only Porteous back for City, he was able to tee-up Kader at the back post, who did the necessary for 2-0. Jardine’s side continued chasing for a route back into the game but Beattie’s blast over from See’s flick illustrated their lack of cutting edge until that point. The former Hearts man was extremely unlucky moments later, leaving Little on his backside before a low, left-foot shot was well tipped wide by Gomes, who until then had precious little to do. Dougie Gair was then inches away but See’s delivery was just too quick for him to get his studs to it. A coming together between See and Gomes allowed the ball to fall for Beattie but, with the keeper grounded, he could only send a half volley high over the bar. Edinburgh City: Stobie, Dunsmore, Donaldson, Porteous, Laird, McKee (Allum 33), McFarland (Cummings 79), Gair, See, Mbu, McConnell (Beattie 63). Arbroath: Gomes, Gold, Sukar, Little, Hamilton, Whatley, Kader, McCord (Malin 45), Doris (Prunty 71), Ferns (T) (Scott 74), Linn.